Among the US election outcomes November 6th was one that attracted little attention relative to the many significant and consequential competitions for local, state, and national legislative offices. As Speaking of Research has written previously, the weeks leading up to the election, the ballot measure was heavily promoted via yard signs, billboards, public debates, and coverage in social media as well as the local news. In the final vote, the referendum failed. The majority of voters, 59% (2,273 votes), voted against expanding the village ordinance to essentially effect a ban on such breeding facilities, with only 41% (1,591 votes) in favor of the referendum. Although the referendum failed, the fact that it made it to the ballot and received intense local attention is noteworthy. Was this the first general election vote on animal research and testing in US history? The first line of the WPR story: “The most divisive item on the ballot this election season in the rural village of Mount Horeb isn’t about candidates. It’s about dogs.” conveys the contrast between the topics many in the US saw as the central election issues and those that were the focus of groups and individuals advocating for the Mount Horeb referendum on research with dogs. It may be surprising to many that dog research was a more contested issue than the many other divisive issues, such as health care, immigration, gun control, etc., that were at play in a particularly heated election. But it is not without precedent. As conveyed here, the legislation arose through a bill introduced by a member of Congress. It was not a direct ballot initiative put before the voting public, though its passage certainly reflected public will in the same manner that any legislative measure may reflect public endorsement. Since the passage of the 1966 Animal Welfare Act (AWA) other federal legislation about captive animals, including not only those in research, but also agriculture and other human use, have been proposed, voted upon, and passed. The AWA has been amended and expanded. In 1985, the AWA was amended so that federally-funded research with purpose-bred rats, mice, and birds would fall under federal regulation and oversight. In 2000, the US Congress passed the CHIMP Act, which directed the Secretary of Health and Human Services to support the establishment and operation of a sanctuary for permanently retiring federally-supported chimpanzees that were no longer involved in research. In 2013, Congress passed an amendment to the CHIMP Act to ensure continued federal funding to provide for the lifetime care of retired research chimpanzees. In none of these cases, however, was there a direct vote of the American public. By contrast, state and local ballot measures concerning the care, treatment, and use of agricultural animals is not infrequent. In 2016, for instance, a “proposal to prohibit the sale of eggs, veal, or pork of a farm animal confined in spaces that prevent the animal from lying down, standing up, extending its limbs, or turning around” won approval from a majority of voters in Massachusetts. In the most recent election, Californians voted in favor of Proposition 12, a measure aimed at requiring cage-free housing for veal calves, mother pigs, and egg-laying hens. In Florida, a majority voted in favor to pass Amendment 13, which bans commercial dog racing. 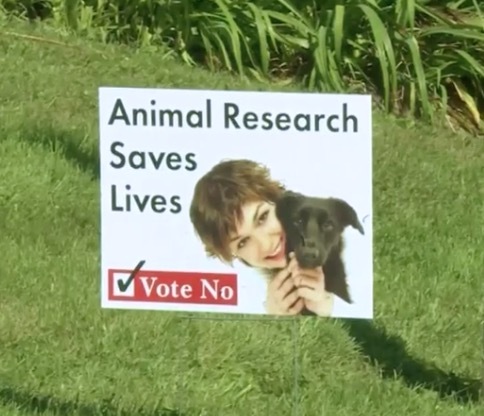 It now appears that the Mount Horeb Wisconsin ballot measure may have been* the first of its kind, a direct vote on a measure aimed at animal research and testing. As this occurs, it will be more important than ever to encourage serious consideration of the full range of likely consequences of decisions about the use of animals in research. The scientific community and research advocates can and should play an important role in providing facts and engaging in public dialog to support citizens’ informed decisions. To do less is a disservice to society. The opinions expressed here are those of the authors and do not necessarily represent the views of their institutions. *Readers are encouraged to let us know in comments below if they are aware of other US ballot measures directly relevant to animal research or animal testing. Posted on December 6, 2018 by EditorPosted in Animal Rights News, News, Science NewsTagged animal research, animal testing, cat, dog, legislation, Mount Horeb, Wisconsin. Previous Previous post: Research Roundup: Alzheimer’s vaccine successful in animal trials, HIV vaccine candidate shows promise and more! Next Next post: Research Roundup: Promising Zika vaccine, improvements to xenotransplants, royal jelly protein for pluripotency, and more! For clarity – outside groups used Wisconsin’s statute that allows for direct legislation referendums via a petition process. The group used questionable methods to get the petition requirements met. There is no breeding facility within Mount Horeb, though there is one in the neighboring municipality. The referendum was a publicity stunt. ugh, how DARE the public vote for cages that allow an animal to lay down or extend a limb!! Those crazy animal right nutters must be stopped!!! Meanwhile lets get rid of the animal welfare act! It is only because of crazy animal activists that it came into existence, it is impeding research! !